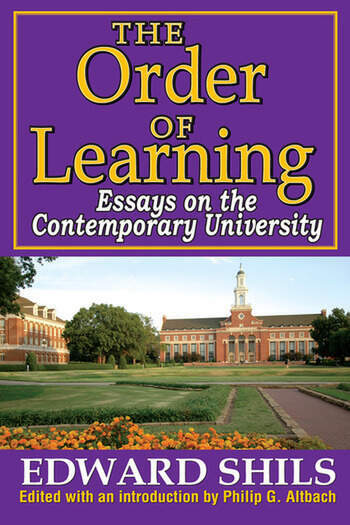 The Order of Learning considers the problems facing higher education by focusing on main underlying factors: the relationship of higher education to government, academic freedom, and the responsibilities of the academic profession, among others. Edward Shils argues that higher education has a central role in society, and that distractions, such as pressures from government, disinterest of students and faculty in education, and involvement of institutions of higher learning in social questions, have damaged higher education by deflecting it from its commitment to teaching, learning, and research. Shils believes that the modern university must be steadfast in its commitment to the pursuit of truth, the education of students, and the provision of research. Universities should not be all things to all people. On one hand, the academic community must understand the essential mission of the university and resist distractions. On the other, government must provide the necessary support to higher education, even when the immediate "pay-off" is not self-evident. This book provides a refreshing new perspective precisely by taking a traditional stance on the role of higher education in modern society. It includes carefully researched and elegantly written essays on many of the central issues facing education today. This work will be of great interest to educators and students alike, as well as those interested in the future of higher education in the United States.